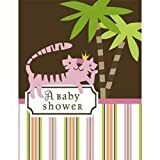 Jungle themed showers aren't just for boys anymore - this adorable pink theme was designed specifically to welcome the new little lioness to the jungle! 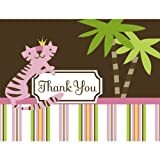 Guests will be roaring with excitement when they see this clever theme throughout all aspects of your baby shower from the invitations to the food to the party favors. 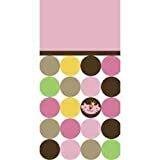 An adorable pink, chocolate brown, and yellow tableware and decoration pattern is available at many local online retailers so if Mom is expecting a baby girl, it is the perfect opportunity to celebrate the Queen! The jungle theme can be a lot of fun because there are so many ways to do it. You can pipe in jungle sounds from a CD, play Tarzan and Jane movies, or play jungle-themed games. Go as far as you like with it. This is a fun theme to invite the men to as well if you’re having a Jack and Jill shower as it’s not as cutesy as some other baby shower themes and the men may feel more comfortable attending. When it comes to the invites for a Queen of the Jungle shower, you have a couple options. First you could simply utilize the standard fill-in invites that match the tableware and decor available from many party supply shops. Alternatively, you can order fully customized invitations like the one shown above that are pre-printed with all the shower details. You can even find ones that feature a photo or multiple photos of the happy expecting couple and the ultrasound image. A cute addition to invitation & thank you envelopes! 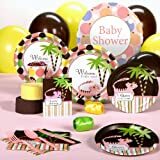 Featuring a lovely brown and pink primary color scheme with green and yellow accents, the Queen of the Jungle baby shower supplies that are available from numerous companies lends itself perfectly to this baby shower theme. 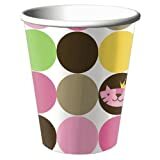 You can even buy party packs that include all the tableware components such as latext balloons, green and pink streamers, dot-covered table cover, beverage cups, dinner plates, dessert plates, napkins and pink silverware. Buy all the items together to save a bit of money if you plan on buying all the items anyway. Otherwise, you can just buy a few of the components and use solid color tableware as a filler since it is usually cheaper. 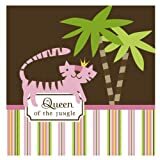 A very cute theme for a baby shower is “Queen of the Jungle.” In this theme, the focus is a jungle setting with your mom as the reigning Queen. You can use this theme if the mom to be is having a girl, of course because you can use pinks. You can tweak it any way you like and it will be just as adorable. 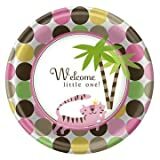 Some jungle baby shower party hosts like to make everything in primary colors, and others choose to go with a pink or a blue accent. It’s up to you. 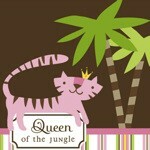 There are some lovely and festive paper goods available in a Queen of the Jungle theme. 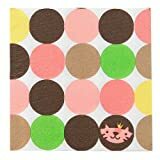 They feature a pink tiger and brown accents. Pinks and browns are a really nice choice because they coordinate well with everything. Order up a set of the themed paper plates, cups, napkins and table cover and you’ve got half your décor done already. See if you can have the shower outside. You’ll be able to do more with the theme. You can bring in large potted trees and twirl strings of lights around them. Go jungle with giant leaves from a craft store. Hang rope vines and have stuffed monkeys swinging from them. Add in lions and tigers in cutouts or as stuffed toys. But even if you’re inside, you can accomplish the same jungle look. You’ll of course need to give the Queen a crown. Make her one out of paper or get her a tiara from a dollar store or party shop. For fun you can make her a cape in a fun leopard print to throw over her shoulders. If you want, have everyone come in safari gear like shorts or khakis and give out plastic safari hats (that you can find in a party shop). Have binoculars out on the tables. You can serve exotic jungle drinks like Pina Coladas or other tropical concoctions with no alcohol for the mom to be. Put fruit in a pitcher and pour in some wine to make a tasty sangria. Have coconuts cut open to serve candies and nuts from. Make a coconut covered cake. Have a giant bowl of tropical fruits as a centerpiece. You might opt to have a cake decorated from a bakery with 3D fondant icing animals. You can spread giant paper leaves under the cake and make that your centerpiece for the whole party. The cake shown to the right was decorated by a professional baker who used the actual invitation as inspiration. Get Even More Ideas For Your Jungle Baby Shower! Cute jungle decorating ideas whether Mom is having a boy or a girl. And if she is having a boy, why not throw a King of the Jungle shower? 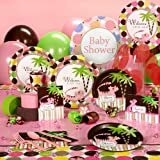 Get tips for every aspect of the shower including fun jungle themed food and decor. More fun jungle or safari shower ideas. A cute animal theme when Mom is expecting twins. Don't forget to try and tie the theme into the baby shower gifts as well. A baby gift basket or diaper cake that features a safari or jungle theme makes a perfect decoration or centerpiece as well as a gift for the new baby. You can also ask that everyone bring a jungle themed stuffed animal for baby. 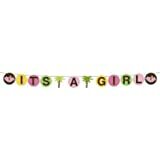 This works especially well if the mom to be is having a jungle themed nursery done up. Get a dog crate or other cage and put all the animals in it for a cute touch that she’ll love when she arrives. 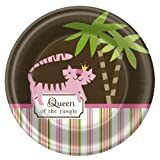 For the baby shower favors, you have many options including the Queen of the Jungle baby shower candle shown above. You can also find personalized favors like hand creams, lip balms, and travel candles that feature custom labels with Mom's name and the shower date. 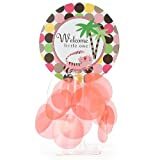 You could also use jungle themed place card holders (lions, elephants, giraffes, zebras, etc) to place around the buffet table to label the foods and then give those out as little thank you gifts to guests. Finally, candy baby shower favors such as chocolate bars with custom wrappers, mint tins with personalized lids, or bottles filled with jelly beans are also great options. The possibilities are truly endless. Is Mom Having A Baby Boy? Consider A King of the Jungle Shower Instead! I love it, animals are such an intricate part of babies development, they love animals and Queen of the jungle is perfect. or should I say purrrfect. Lots of great ideas here! I would have never thought about having a 'queen of the jungle' shower but it's actually really cute! So cute. I have a friend who is expecting and will soon be planning a baby shower. I will send this to her on Facebook. Such a great idea for the baby shower.